© 2018, Tamkang University. All rights reserved. The Global Financial Crisis has placed considerable pressure on government service delivery responsibilities throughout the world. This comparative analysis of the participative policy-making approaches and their impact examines the political processes of negotiation and developing consensus. 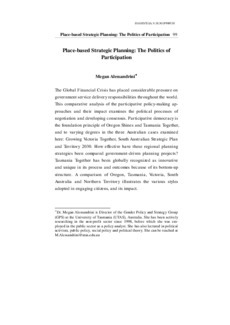 Participative democracy is the foundation principle of Oregon Shines and Tasmania Together, and to varying degrees in the three Australian cases examined here: Growing Victoria Together, South Australian Strategic Plan and Territory 2030. How effective have these regional planning strategies been compared government-driven planning projects? Tasmania Together has been globally recognized as innovative and unique in its process and outcomes because of its bottom-up structure. A comparison of Oregon, Tasmania, Victoria, South Australia and Northern Territory illustrates the various styles adopted in engaging citizens, and its impact.